This initiative is designed to improve sportsmanship in schools and the community. Sportsmanship is an issue that affects everyone. 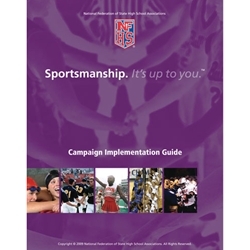 The "Sportmanship, It's Up To You" campaign is based on respect and involves personal responsibility. It starts with a mindset and ends with behavioral choices. In this kit you will find the necessary information and media resources to implement a successful sportsmanship awareness and improvement program in your school. The campaign comes on 2 DVD's. The resource DVD contains the implementation guide (pdf), overview video, motivational video to share with your school and community, various customizable posters, live-read scripts for school annoucements and radio spots, Student pedge cards, a logo/photo library, and guidelines. The presentation DVD is for a large audience. The disc houses a full-screen, full resolution videos. Videos included are the campaign overview, motivational video, and 3 broadcast PSA's.